Sometimes we don’t notice the wonder and beauty of some of the more common plants. On one of my recent walks I noticed that the Barrel Cactus (Ferocactus wislizeni) was beginning to bloom. It’s nice to see that happening now. It’s been a long, extremely dry summer here. The bright orange red flowers and yellow fruit are truly delightful to behold this time of year. Our Barrel Cactus, so common in Sabino and around Tucson, is one of many cacti with the epithet ‘Barrel.’ The cacti of the genus Ferocactus are varied and can range from less than a foot tall to as much as 12 feet. 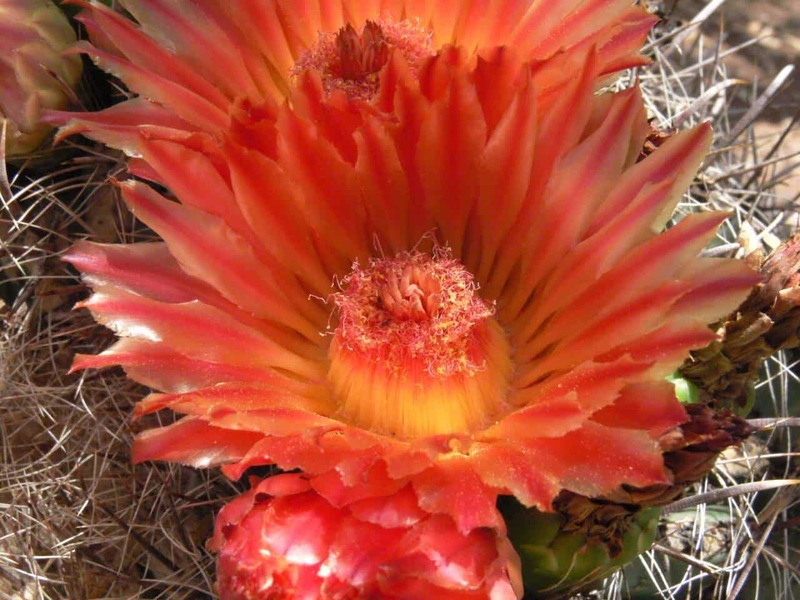 Most of the Ferocactus flower in summer and are pollinated by bees. Fruit and seeds are eaten by rodents, birds, mule deer, bighorn sheep and javelina. The plant itself is eaten by giant cactus beetles, jackrabbits, packrats and again, the javelina. The Barrel Cactus is easy to identify on shape alone. 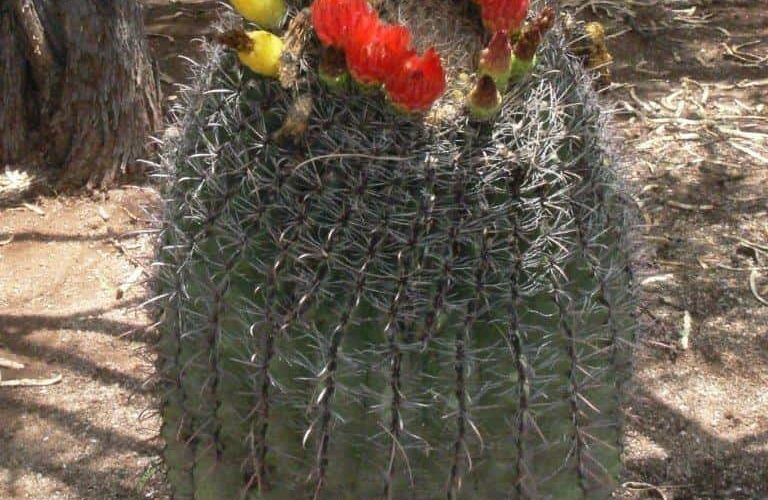 Look for large barrel shaped cactus with ribs bearing spines with a strongly fish hook- shaped center spine. These cacti are usually 2-4 feet tall, but of course are smaller when younger. They are often called Compass Barrels because large plants often lean to the southwest. However, I caution against using it for navigation, as I have seen them face other directions too. Large plants may topple over when it rains due to the excess weight and soft wet soil. One of the myths about the Barrel Cactus is that they contain a reservoir of water that can be tapped and drunk. While animals and indigenous peoples have been able to extract liquid from these cacti, I would caution against thinking that it will save you in case you forgot to bring water with you on a long hike. Best to bring enough drinking water from home in your reusable bottle. It would take a lot of tools and know-how to be successful with the cactus, and more importantly, all native wild cacti are protected by state laws; it is illegal to take or destroy any native cactus.